Paul Crompton talks to Neil Simmonds of Corvus Energy about the less-than-obvious market for marine hybrid power, supported by highly ruggedised lithium-ion batteries. The sun is rising above the North Pacific Ocean. Oil tankers, container ships and barges are being moved into position at the Port of Los Angeles. Among the everyday scene of big industry going about its daily business, a small tugboat silently chugs its way to its first ship assist of the day. But this was no average day in 2009, this day proved to be a milestone for the merchant shipping industry. That’s because the small, unassuming green tug had been fitted with lithium polymer batteries; this was the US’s first hybrid tug. Skip forward six years and Corvus Energy has completed 30 similar hybrid, plug-in hybrids and pure electric projects using its bespoke battery packs, fitted with nickel manganese cobalt pouch cells. This year the company is scheduled to supply packs for four more new build hybrid boats: three ferries and one offshore vessel. To date the majority of the Canadian company’s hybrid projects are evenly split between retro-fit and new build applications. When the battery industry discusses the brave new world of battery power, electric vehicles, stationary energy storage systems (ESS) and of course personal gadgets fill the agenda. But Neil Simmonds, Chief Technical Officer at Corvus Energy believes the real market lays in the merchant marine industry. Simmonds is one of the founders of the Vancouver based company, and now along with his three senior executives Andrew Morden, Chief Executive Officer; Neil Lang, Chief Operating Officer and Halvard Hauso, Executive V.P. Sales and Marketing. With almost fifty years of combined history in the marine and battery industries, they all shared a vision that a ‘ruggedised’ lithium-ion module for use in heavy industrial applications would transform the shipping industry. 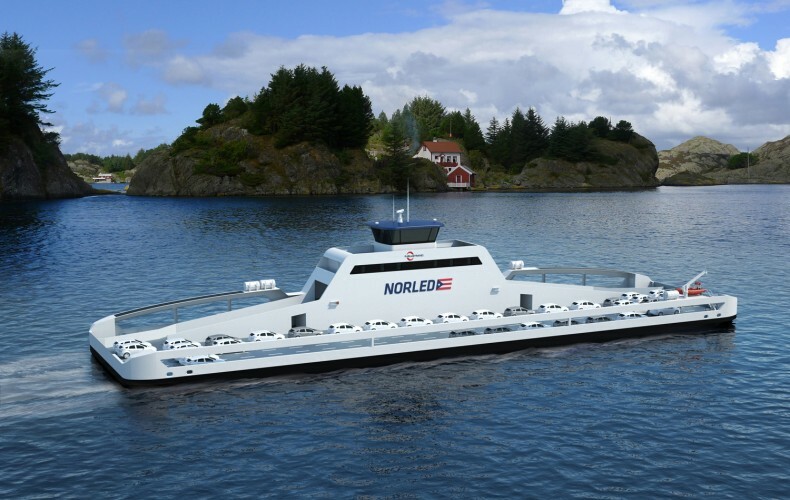 cut costs when ship assisting, vessel escorting, dynamic positioning or simply powering the ground breaking Ampere pure electric ferry in Norway. Simmonds, who holds more than 70 battery-related patents and helped produce the first lithium‑ion batteries for the EV market, believes the market has unlimited scope. He said: “I found lithium-ion batteries to be too expensive to work in cars, and so I moved to the marine sector and found the market is bigger than in cars. For example, if a car uses a 50kWh pack, our applications are using 500kWh, so OEMs are having to produce 10 cars for every vessel we supply.” However, this is just an example. With more the 30MW of energy storage deployed to date, the packs go from 78kWh (tug boat) to 2,600kWh (a retro fit ferry for Scandlines). With around 50,420 merchant ships trading as of January 1, 2015, according to statistics portal Statista, that is a lot of potential MWs to be retro-fitted. The key word here is ‘economic’. Simmonds sees customers in the merchant vessel industry making savings within two years of retrofitting a Corvus Energy pack. The saving come straight away in purpose built vessels. With a life span of up to ten years, it doesn’t take a Nobel Prize mathematician to work out the financial benefits. The savings come from having to use less fossil fuels, ie diesel, because waiting time is the most inefficient time for a boat. Take for example that little green tug in North America. It will stay in the dock until it is required to go to a vessel’s location. Then when required to push a ship around, known as a ‘Ballard Push’, it will use its big gen sets for power. If the owner can turn off the engines and go to and fro from the harbour to ships under electric power, it can reduce up to 30% off fuel bills, says Simmonds. A side effect of this cost saving is companies can also reduce their environmental impact. So what is it that Corvus offers that is unique? Well other than the system itself, they offer a bespoke design, manufacture and commission/service. This involves Corvus application engineers working closely with the customer’s engineers prior to production of the batteries. This, the company says, ensures a high level of coordination and control of the battery alarms and parameters in operation. However, Corvus Energy’s battery packs are only as good as the cells they use. That is why they chose Kokam to manufacture them. Simmonds says the Korean firm was handpicked because they were the first company to produce nickel manganese cobalt pouch cells, although, he adds, ‘we will consider using anybody who makes the cells’. Kokam had the original cells because they held the patent, which originally used a three fold continuous separator in each cell, 43 positive cathodes and 43 negative anodes layered inside, explains the battery industry veteran. The company claims to be able to get up to 10,000 cycles from packs, which can run safely for 10 years. To do this the company uses battery management systems to monitor the packs and change the use profile of the pack when required to increase the cycle life. To do this the company uses its proprietary modelling software to calculate the load profiles of the ship in combination with the cell chemistry to get the most efficient performance of the battery within their propulsion system. The company then manufactures a rugged, marine-ready battery pack which is built to the customer’s customised design. Simmonds says EV packs operate at 300volts somewhere near 100 amps, but Corvus’ operate at 1,000 volts. In this respect, the marine packs are similar as those used in EVs, but the scale is very different. The packs also allow customers to run the vessels in full hybrid mode. Simmonds said: “A car hybrid is more about acceleration assist, in our case the vessels are in electric mode or not, and are a true hybrid, not a combination.” This hybrid mode also allows the battery in applications to be charged using excess energy generated by the vessel’s diesel gen-set, which is run at full RPM for the greatest efficiency. But the company doesn’t just sell a pack and walk away. Through its commissioning/service Corvus ensures the battery is ready to be installed and commissioned on the ship. Integration of the battery pack into the customer’s system is one of the key services it provides. This integration process, which sees it working with the ship’s owner, ensures the pack is installed to the highest safety specifications. The size of the merchant fleet. Safety concerns are never too far away when discussion turns to using lithium. Airlines have banned cargo shipments of the chemistry, and consumer products are regularly being recalled due to problems. So safety is a key topic, after all we are talking about huge amounts of energy— 500kWh and up. On land a matter of thermal runaway in an EV is a dangerous prospect, fifty miles from shore and the issue becomes deadly. That is why Corvus Energy goes for safety as well as performance, Simmonds said. Safety measures include housing the pack’s cells and internal battery structure in a proprietary thermal conductor, which enables heat to be wicked away from the inside to the external enclosure using a passive cooling system. 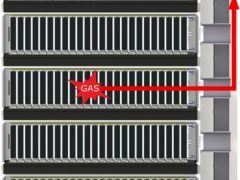 The Battery Management System (BMS) provides reports on warnings, faults and the rack system provides fire suppression. Corvus recently performed a series of thermal runaway mitigation tests to show how inherently safe and reliable its battery technology is. The company deliberately overrode all of the built-in safety systems and induced thermal runaway in a Corvus battery module. In total, Corvus has completed 11 separate tests to verify the design of its module, racking, and water mist system. The tests were conducted at SP Fire Research in Borås, Sweden. Ten of these tests involved forcing a complete Corvus AT6500 battery module into thermal runaway. During these tests key parameters were varied, including whether or not there was a source of ignition and the timing and flowrate of the water mist system. So rigorous are the company’s safety standards that it guarantees the IP67 rated packs can be immersed under one metre of water for 30 minutes, subjected to 30G of shock and 8G of vibration, and still operate. They also test each module (containing 24 76amp cells) for all types of shock vibration, and saltwater ingress. This is stringent self-regulation, but when you are the only firm designing packs specifically for the marine industry, it pays to take it seriously. That is why Corvus Energy works with The American Bureau of Shipping (ABS), ISO, independent certification service Lloyd’s Register Type Approval, and maritime classification, verification, risk management and technical advisory service DNV-GL. It means the company can boast of having the only lithium battery Type-Approved by DNV-GL, Lloyd’s Register and ABS. The company aims to expand as the demand in the marine world rises. This doesn’t just include new builds, because the ESSs can be retro fitted to any vessel— that’s currently more than 5,000 potential customers from private yacht owners to ferry operators. These applications are new to us as well, we are breaking new ground, said Simmonds. “We are the only company doing this for the first time in the market for these types of applications, so we are still developing the market,” he added. Constrained only by our own imagination, perhaps we are only just scratching the surface when it comes to the true potential for battery technology. Corvus Energy thought outside the box when it set sail into the untapped merchant marine industry. They believe the real market for lithium batteries is in EVs— that’s Electric Vessels— and have the technology to back up their claims. Environmentally speaking, moving to hybrid and pure electric vessels makes sense, but it will be the accountants who will be rubbing their hands about what Corvus Energy is doing. Retro fit a battery pack today, and in two years it has paid for itself, giving ship-owners a potential further eight years to reap the 30% plus savings on fuel. It seems too good to be true: a technology proven in real world applications, is safe, and will save money. But then all good ideas seem too good to be true until they become the industry norm.